That last shot is of four duck breast prosciutto from Il Mondo Vecchio in Denver, which is closing its doors at the end of this month (November 30, 2012). I’m heartbroken and upset about the closure because I love this small local business and their quality products. 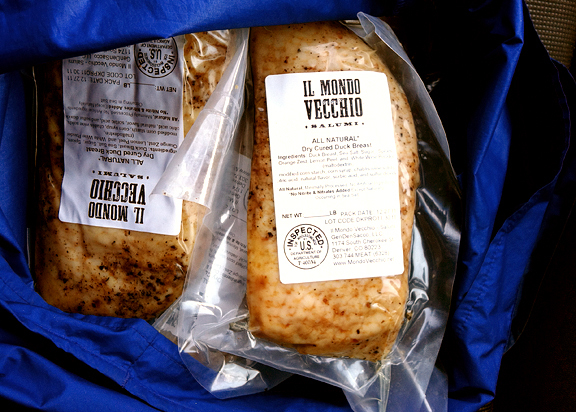 I’ve ventured down to their Denver loading dock before, but then Cured (in Boulder) began to carry Il Mondo Vecchio’s salumi such that I could gift duck breast prosciutto to a deserving hostess from time to time. You can use frozen spinach if you don’t want to deal with fresh spinach. I had fresh spinach on hand and rather like the idea of knowing exactly what is in it. 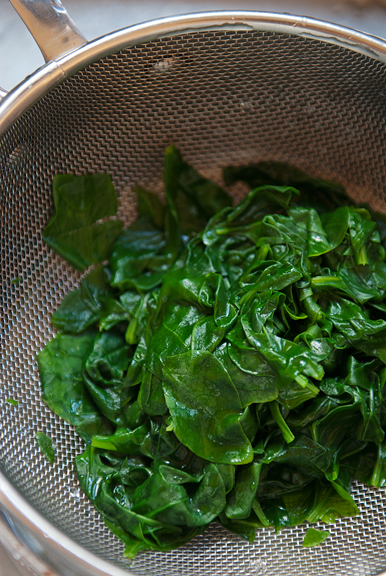 It’s a quick blanch in boiling water, then drain it and squeeze it out just like you would frozen spinach. 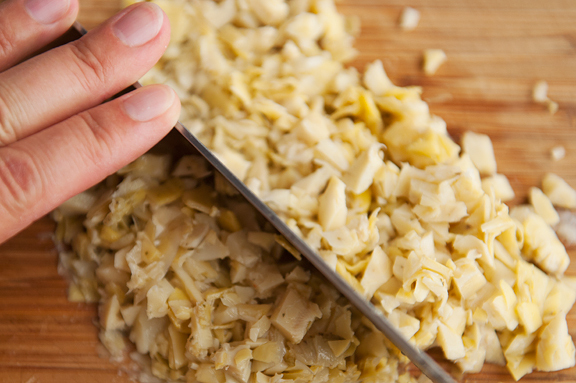 Chop it up and you are good to go. 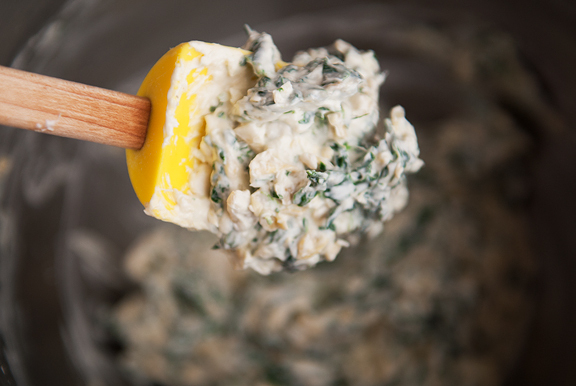 This is like the cream cheese version of this artichoke dip with spinach tossed in for good measure. Actually, it lacks the oomph of the garlic, but think of it as the mellower cousin. It’s chock full of spinach and chunky artichoke. 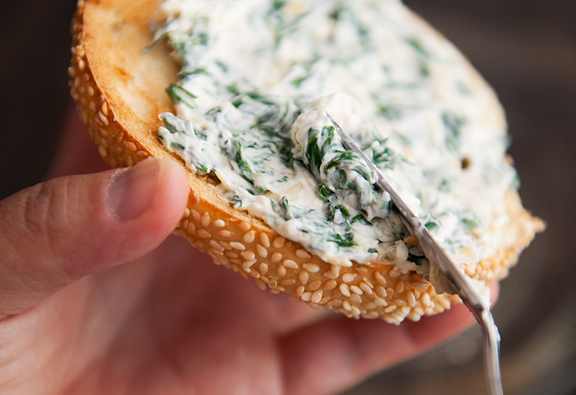 Sure I love this spinach and artichoke cream cheese on a bagel in the morning. I also like it on a bagel with tomato slices and muenster cheese melted on top for lunch. You could even put a fried egg on that for the Ultimate Decadent Bagel of Yum. I may or may not have eaten a spoonful as is. Don’t judge. Make a batch and tell me you didn’t do that too. 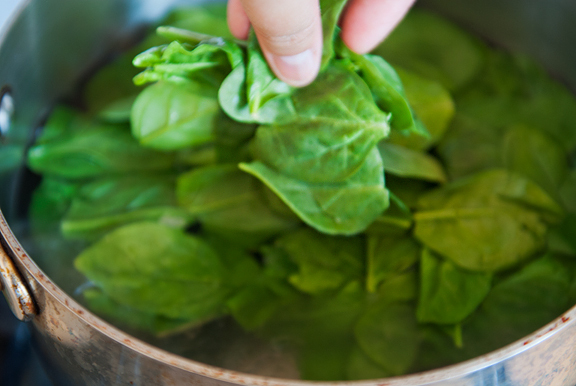 If using fresh spinach, blanch the spinach leaves in boiling water for no more than a minute and drain. Squeeze the spinach out as much as possible. 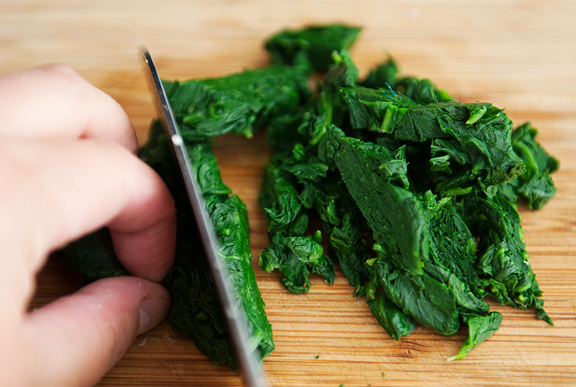 Chop the spinach. 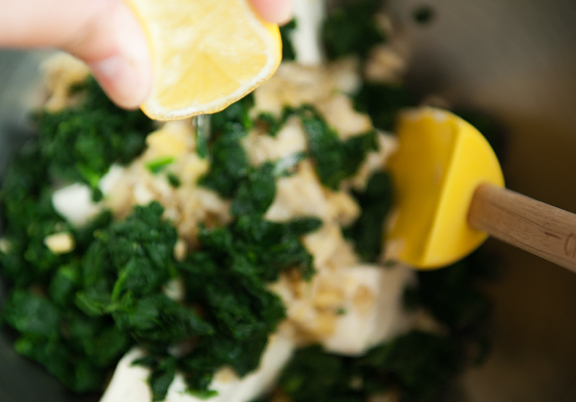 Mix the spinach, cream cheese, artichoke hearts, pinch of salt, and lemon juice (to taste) until blended. Makes a pint. No snow?? We got more than a foot on the flats and 4 feet in the mountains! Maybe it’s on its way to you now. I hope so. This is exactly the type of thing I like to do when I really want to go to the bagel shop. :) Hooray for homemade veg-filled cream cheese! What about using it for finger sandwiches!?! 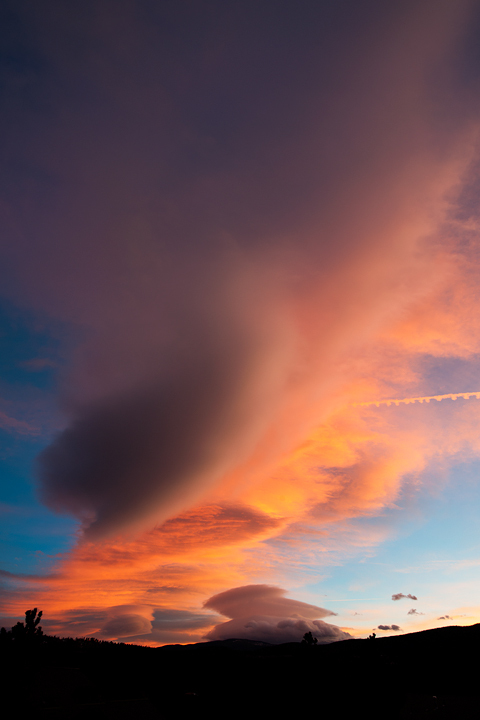 Could have gazed at that sunrise for a very long time. Surprised you ever get round to baking with that distraction – however can’t imagine those temperature. Lovely dip. 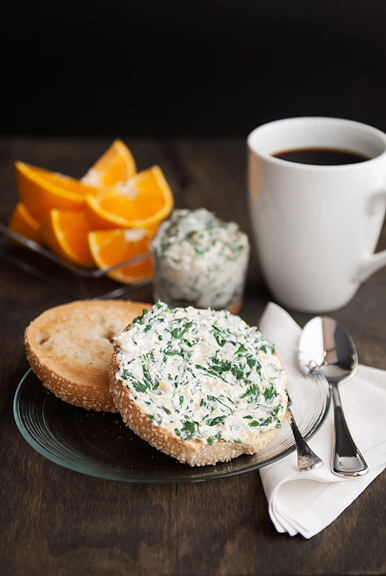 This looks delicious and it is vegie cream cheese that most ladies like that. I sure will make some when I host our wine and dine group next spring. great idea ! it seems delicious ! So many delicious things all wrapped into one amazing appetizer. 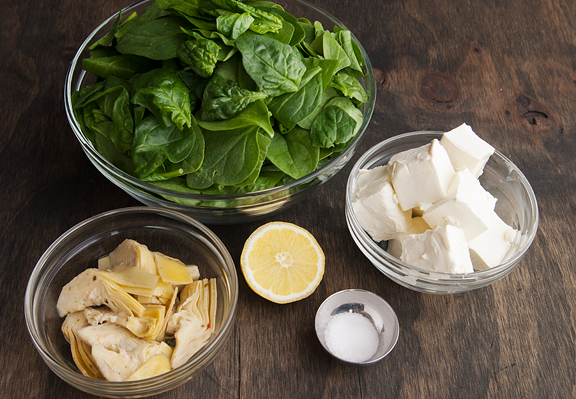 I’m a sucker for just about anything artichoke, but love the idea of the addition of fresh spinach. YUM! I’m always looking for some new and delicious way to eat my homemade bagels. I’m inspired to make your spread this week! Thanks so much. So I was just listening to Deb Perelman (of Smitten Kitchen fame) on a local radio show talking about her parents making bagels from scratch, and I’ve decided to make that a project for this weekend. So I was pleased to come across this recipe– it will complement the homemade bagels beautifully! Plus I have half a jar of artichokes hanging out in the fridge, and cream cheese is on sale this week. Perfect! Eileen – yeah, I really like making my own so I can put whatever I like it in! Liz – how about fried egg AND smoked salmon?! YES!! Margie – I’m jealous again about your garden! Those burritos look legit! 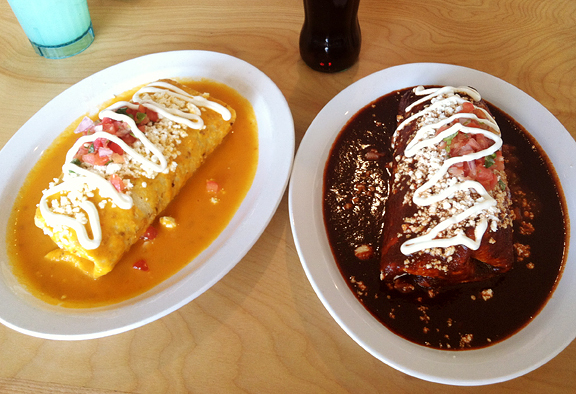 Have you tried the breakfast burrito at Snooze? This is the second time making this recipe and I love it! This time around I added some leftover sundries tomatoes and subbed baby kale for spinach since I already had it and added a bit of garlic powder. Soooooo yummy!